UKIP have taken control of Thanet District Council, making it the first UKIP-controlled local authority. 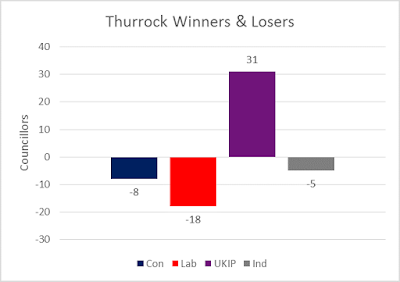 The landslide victory has seen 33 UKIP councillors elected to Thanet District Council compared to just 18 Conservatives, 4 Labour and one independent. This means that the council will now have a UKIP leader and cabinet until the committee system can be reinstated, giving the opposition Labour, Conservative and independent councillors a fair share of the decision making. The far left extremist Green councillor, Ian Driver, who spent more time organising anti-UKIP protests than he did being a councillor now has more time to devote the cause after losing his seat to UKIP councillors Janet Falcon, Sarah Larkins and Hunter Stummer-Schmertzing. Prior to Thursday's elections, the political balance of the council was very different. Labour controlled the council with 26 councillors, the Conservatives were a close second with 22, UKIP had 2 councillors and there were 6 independent or unaffiliated councillors.